As a Precinct Captain for Barack Obama (Travis County Precinct 274), I have set up a House Party today to reach out to voters, talk to them about the candidates, and educate people about the primary and caucus voting processes in Texas. Directions: Spider House is north of the UT campus on Fruth St., just a block east of Guadalupe, and between 29th and 30th St. I did snag a "blueprint for change" booklet at the rally last night, and also got a few lists of Travis County early voting locations and a candidate list when I voted yesterday. I have found that one-on-one contact with voters is very persuasive, so everyone is welcome to join me and talk to people about Barack, and about the primary and caucus processes in Texas. I will try to grab a table or two right at the front of the garden just inside the entrance so we're really visible to people walking by on the street. View and RSVP for this event at any time by going here. Your party affiliation is determined by whom you vote for in the primary--Republican or Democrat, so you don't have to have registered as either one. You can do early voting at any of the early-voting locations in your county from February 19-29 (highly recommended), or vote at your precinct's polling place on March 4th. If you do early voting, your name will be on the rolls as having voted, and you can also get your card stamped then. If you vote on the 4th, make sure you get your voter's registration card stamped so it's easy to show it later on. Then, all you need to do to caucus for Barack is to arrive at 7:01 after the polls close and show that you have just voted in the Democratic primary, either during early voting, or earlier in the day (whip out that stamped voter reg. card) and then you sign your name on a card in support of Barack. You can stay for the meeting after that, or just turn in your card and leave. After signing cards to caucus for Obama, the rest of the evening of March 4 is given over to what is called a Precinct Convention, where party platform issues and resolutions are introduced. This link is general information about the Texas Primary/Caucus. This Burnt Orange Report link has fairly detailed information about how to introduce resolutions. And yes, I am having an Oscar Party on Sunday, but with all the election excitement, I just haven't gotten around to sending out invitations. There was an article by Mona Charen posted a few days ago on townhall.com about Barack Obama called "Old Wine, New Bottle." It made a lot of false claims about his policies and intentions, so I posted the following comment to refute a couple of the most troubling misstatements. First of all, Obama isn't advocating subsidizing environmentally friendly or "green" products. You're right, if there's a market for them, there's no need for subsidies. He's advocating investing in researching and developing alternative energy sources and technologies, and countering the recent influence of big oil. Big difference. When oil companies put all their considerable resources behind eliminating competition--as they did in the early 20th century by encouraging cities to get rid of streetcars and use buses instead--it can have a significant effect, and Obama wants to make sure we stop being so dependent on fossil fuels. Also, I would say that the war on terrorists has been sorely neglected by President Bush, who stopped focusing on Afghanistan and the border areas of Pakistan, where Al Qaeda is actually based, in order to invade a country previously entirely unconnected with Bin Laden. Obama's stated goal is to refocus on finding Bin Laden, and eradicating his organization. You also imply that Obama is unwilling to use military force in any situation, and will instead rely exclusively on diplomacy, the way that you claim Jimmy Carter did. First of all, Obama has said that he's not categorically opposed to all use of military force or all wars--just "dumb wars" and "rash wars...based not on reason but on passion, not on principle but on politics." If you will remember, Carter hardly had a "diplomacy-only" approach. But his attempt to use military force to rescue the hostages in Iran was disastrous. It was his skill in diplomacy that finally secured their release. Try telling the families of the 4,000 American dead and 29,000 wounded that the rush to invade Iraq was a good idea and that diplomacy is "misguided" and "senile." Just this past week, I signed up to be a Precinct Captain for Obama in Austin, Texas. My precinct is 274, and our polling place is the First English Lutheran Church. I'm excited about getting out the vote for Obama and making a difference in Texas. Look closely at the two Democratic front-runners for president and you will see similarities in how they address challenging problems confronting the country. Sens. Hillary Clinton of New York and Barack Obama of Illinois both talk about strengthening the middle class, expanding economic growth and lifting sagging wages. Both offer solutions for the crisis in our health care system and global warming and support ending the war in Iraq. So the key differences between the candidates are in their leadership styles and visions for the country. Obama presents a view of governing that is inclusive and relies on Americans to work with their government to solve sobering problems at home and abroad. Obama’s familiar refrain on the campaign trail is, “Yes, we can.” By contrast, Clinton promotes a self-centered governing style that drives home what she would do as president. She asks little of Americans and discourages opposing views. Clinton has moved from her position as first lady that it “takes a village” to solve problems to "it takes only Hillary (and maybe Bill)." Those contrasts offer a clear choice: Barack Obama. His optimism, unifying vision and ability to inspire are the kind of healing balm the country needs at this moment in history. In two days, on “Super Tuesday,” 22 states will hold Democratic primaries and caucuses. The outcome of those contests might determine a winner. If not, the battle moves to Texas on March 4. Obama is the best pick Democrats could make. Obama brought that style of leadership to Washington. He worked with Sen. Tom Coburn, R-Okla., to sponsor and pass legislation that would assist taxpayers in tracking government spending - including earmarks and federal grants - with a Google-like search engine. Obama showed courage in opposing the Iraq war in 2002 as a candidate for the U.S. Senate, years before that was the popular position. He backs aggressive diplomacy in dealing with America’s adversaries, including talking to our enemies. But he isn’t against the use of military might and continues to support the war in Afghanistan. We also believe that Obama is more electable than Clinton, who would no doubt energize dispirited Republican voters. That makes Obama a stronger nominee for the Democrats going into November. In another election, we might look for the kind of experience Clinton brings from her role as a U.S. senator and tenure as first lady. But these are different times. Abroad, the country is at war. The terrorism threat remains alarming. America’s moral standing has been diminished by Guantanamo and the Iraqi occupation. At home, we’re divided into red and blue camps. Democrats and Republicans have stoked divisions to advance their party’s interests. Meanwhile, Washington is stumbling along with its red leg moving right and blue one lurching left. Along the way, elected officials - and the public - have forgotten that those legs are part of the same body. It’s not surprising, therefore, that we’ve danced in place, failing to make progress on the big challenges that confront our country. Young people, disillusioned and disheartened with their government, have tuned out. No other candidate except Obama offers a way out of that rut. He has articulated a vision that would allow the legs of government to again move fluidly in a natural motion that takes the country forward. Young people hungry for purpose have flocked to Obama rallies in rock concert numbers. They’re not just cheering but volunteering. Older people, especially African Americans, send small donations and passages from Scripture as they look to him to fulfill America’s promise. Like a veteran slugger on deck, Hillary Clinton has campaigned principally on the logic that it is her turn at bat. Democrats must resist the instinct to select the next in line and grab instead the best hitter on the bench. That is Barack Obama. The writer's strike threw the Oscarcast into question this year, and now primary election frenzy seems to be gobbling up all my time. The official invite is below. For the first time, I will be showing the Oscars in High-Def TV on my new giant screen. Yay! The red-carpet part of the broadcast starts at 7, but I encourage everyone to come around 6:30, get a drink and a bite to eat, and finish filling out your ballots. I will provide cocktails, as usual, and this year will serve Helen Spencer's Famous Chili and some snacks, but not the insane spread of years past, so please feel free to bring munchies to share. P.S. Don't forget to vote. Early voting in Texas is Feb. 19-29, and then the regular vote is March 4. It's an open primary, so your vote determines your affiliation. Also, there's a caucus on March 4th that will determine additional delegates for the presidential election. All you have to do is show up at your polling place at 7:00 p.m., show that you've voted in the primary, and sign a card for your candidate. Ask me for details. She was inspired to donate money to Obama's campaign, but because she is a registered lobbyist for MetLife, she couldn't donate, even though it was a private donation, not in her capacity as a MetLife employee. A bummer, but I'm glad that Obama refuses corporate and lobbyists' donations. This is a bottom-up campaign, not top down. Frank Rich's column in the NYT today quotes a Latino L.A. Times columnist who claims that the Clinton campaign is trying to "sow misinformation and racial division." Even though there are a lot of commenters protesting what they claim is Mr. Rich's "biased personal attack," I think he makes some valid points about character. Bill Kristol's NYT column, also interesting, especially coming from a conservative. You've all seen Obama's "Yes We Can" video; here's the link to the McCain parody video. More like "No, We Can't." Here's a link to a Laurence Lessig video on why he's for Obama. Here's a link to a transcript, which might be quicker if you just want the ideas and not the whole 20-minute video presentation. And a verrrrry interesting Op-Ed piece from the notoriously conservative Wall Street Journal, written by none other than former Reagan speechwriter Peggy Noonan, saying that in the general election, Obama is "bulletproof." And also, "The Democrats continue not to recognize what they have in this guy. Believe me, Republican professionals know. They can tell." Oh, and I was looking for yard signs online the other day, and there was this huge comment thread on Obama's website blog, and I discovered that the online store is backlogged by several weeks, and so someone used Ning to set up a new online group called "Obamacycle" where people who live in states with upcoming primaries can post asking for campaign signs and gear from people in states whose primaries have passed. I have posted a request on there for yard signs, but haven't gotten any specific offers, except for someone around the corner who said that if he gets extras from out of state, he'll give me one. [Update: I did get a sign. Yay organization!] I was just going to say that if you have any friends, neighbors, or coworkers who have extry signs (not the stakes, just the signs) I'd love to have them. David Cay Johnston has written a new book about the ways the rich get richer at our expense. Terry Gross did a really interesting interview with him on Fresh Air a few weeks back. The title of his book is: Free Lunch: How the Wealthiest Americans Enrich Themselves at Government Expense (and Stick You With the Bill). It's great to have all the evidence in one place. 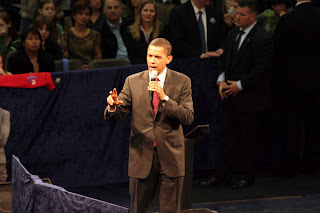 Tonight, I'm watching Barack Obama speaking at a rally in Boston the night before the Super Tuesday Primaries. I continue to be impressed by his ability to bring together diverse audiences with his positive message, while not being afraid to tell people (like oil companies and teachers' unions) the hard truth. I'm still unemployed and living off my savings, but I felt compelled to contribute a little something to his campaign effort. Whether you do or not is up to you, but if you're not currently a supporter, I hope you will seriously consider his candidacy. Check out this viral video of his speech from New Hampshire; perhaps it'll inspire you to join his movement for change.